Mwakaribishwa na Maroon! That's Swahili for "Welcome to Maroon." 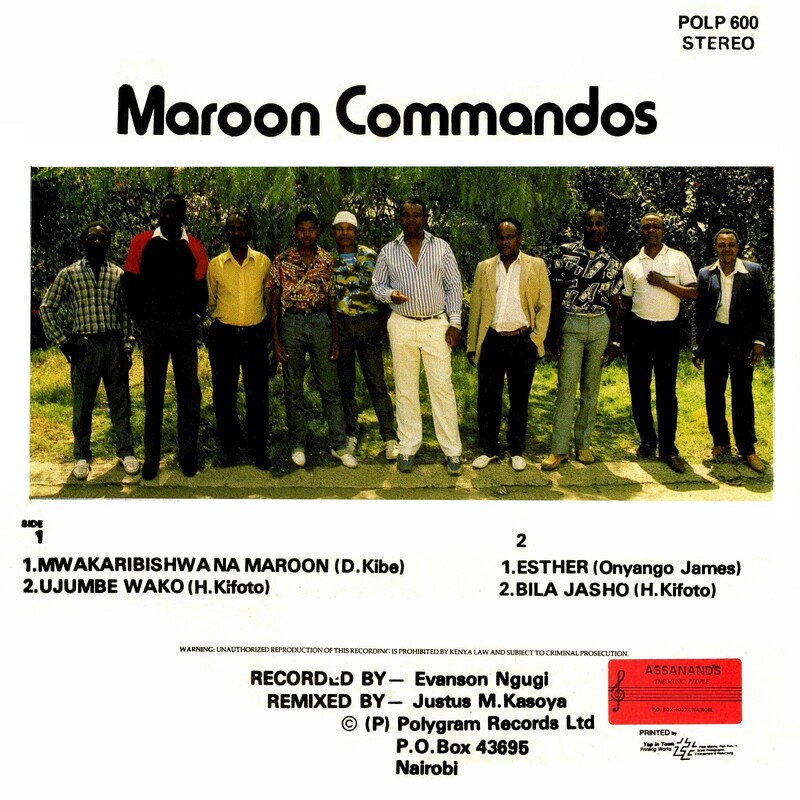 It's also the title of today's featured recording (Polydor POLP 600, 1989) by Kenya's legendary Maroon Commandos. The Maroons have been around since 1970, founded by Habel Kifoto (that's him on the left above) as the offficial band of the 7th Kenya Rifles of the Kenyan Army, based in Langata Barracks, Nairobi. The Maroons' modest goal in the beginning was to tour the country entertaining homesick troops, but it wasn't long before their infectious blend of rumba, benga and traditional music caught on with the general public. 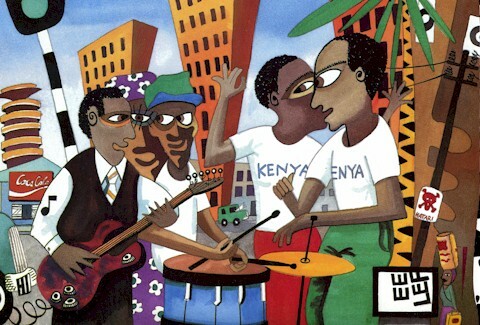 Their first hit was "Emily" in 1971, and then an unfortunate traffic accident in 1972, which killed one member, sidelined the group for several years until they came roaring back in 1977 with "Charonyi ni Wasi," which is included on the collection Kenya Dance Mania (Sterns/Earthworks STEW24CD, 1991). Written by Kifoto in his native Taita language, it is a sad melody of nostalgia and hard times in the big city. I shared another great song by the group, "Liloba," in an earlier post. That one, by the way, featured the vocals of Laban Ochuka, who later founded the Ulinzi Orchestra, the subject of a future post. Three nights a week 20 Kenyan soldiers take a break from the rigorous routine that defines their military life from sunrise to sunset. On these nights they let another side of their personalities take over as they mingle with civilians through music. Hands trained to hold weapons hold guitars, trumpets, drumsticks and microphones. Feet accustomed to marching in formation and jumping in and out of trenches tap lightly, keeping beat to the music. Voices conditioned to bark out orders in military drills croon words that have entertained generations. And the faces that seldom crack the faintest of smiles soften and become warm. During the two hours on stage there are no ranks, no obligatory salutes. During this rehearsal, united by their common love of music, they are all equal. 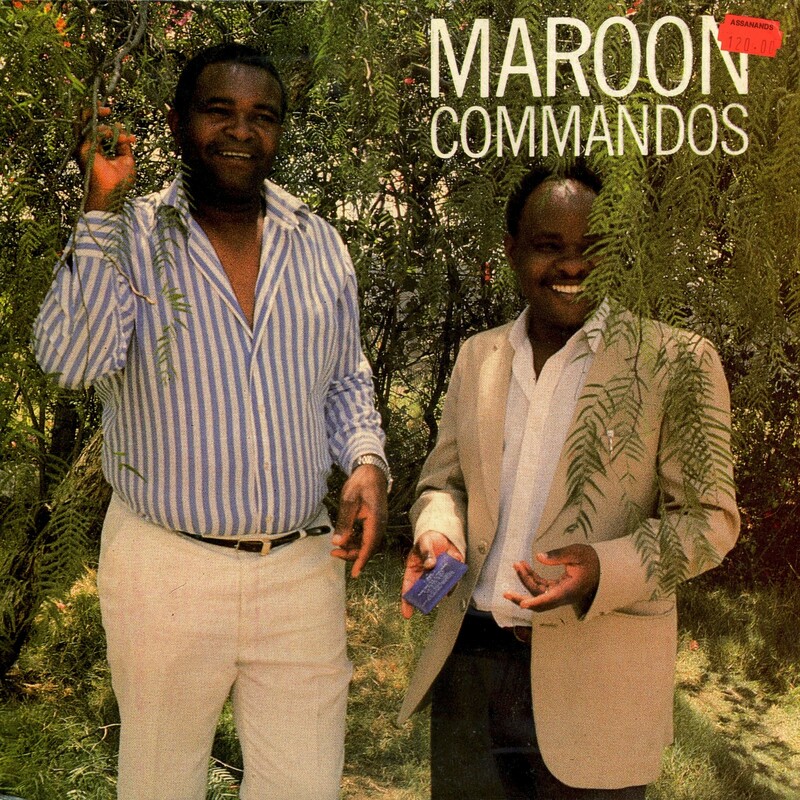 After a ten-year recording hiatus, the Maroon Commandos returned to the scene in 2007 with a new album, Shika Kamba, and have continued to entertain East Africans up until the present. I was saddened to learn while researching this post, though, that Habel Kifoto passed away in 2011. He had retired from the Army in 2009, passing on leadership of the band to Diwani Nzaro and subesquently Sgt. David Kombo. Kifoto remained active in music, however, and is said to have recorded a new album just before his death. Download Mwakribishwa na Maroon as a zipped file here.